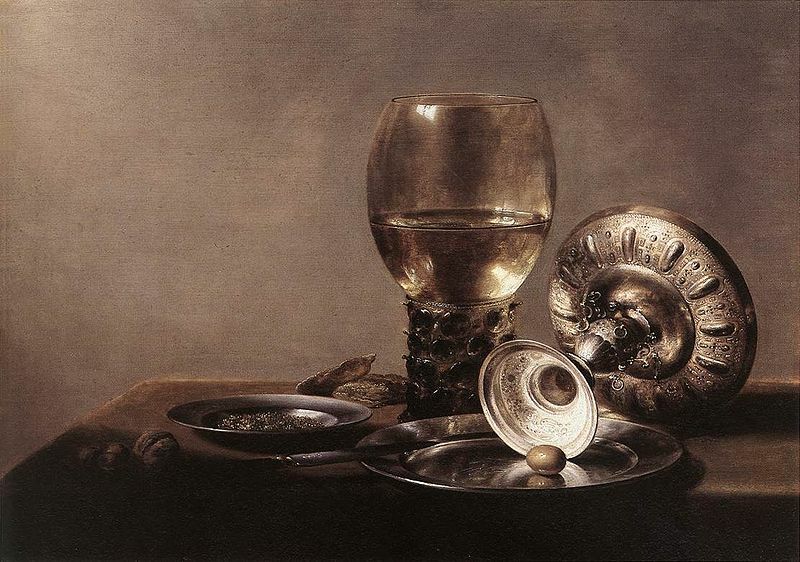 ..The Berkemeyer Project..: Reproducing a Dutch Golden Age Still Life Painting with Photography. Challenges and Learnings. Reproducing a Dutch Golden Age Still Life Painting with Photography. Challenges and Learnings. The real challenge of this work is the lighting, to reproduce the lighting as shown in the paintings proved a bigger challenge than the arrangement of objects. There is no way that the lighting used at the time was just coming from the window as someone may think from looking at the painting. Note that both painting have a chiaroscuro treatment with the objects being lit from the side, while the background is lit apparently from the side window. I am planning to write another article addressing this with a more graphic diagrams because I had to use 4 lights to get the images you see below, which are close enough to the paintings. For every exposure, I would painstakingly arrange the table and objects by comparing to Claesz painting, then take the photo, look through the camera, zoom in and realize that the overlapping of the tazza and roemer was not the same, or the lemon peel was not there, or the berkemeyer was off. Then, go back to the table, move the tazza closer, take next, then move the roemer, etc. The non assuming arrangement of mostly unimportant objects (at least in the early years of the Golden Age) seems simple enough. The Dutch Masters of the Golden Age lit the objects in their paintings mostly from one side given them a more dramatic appearance, but I believe the real purpose was to reveal their complex textures. 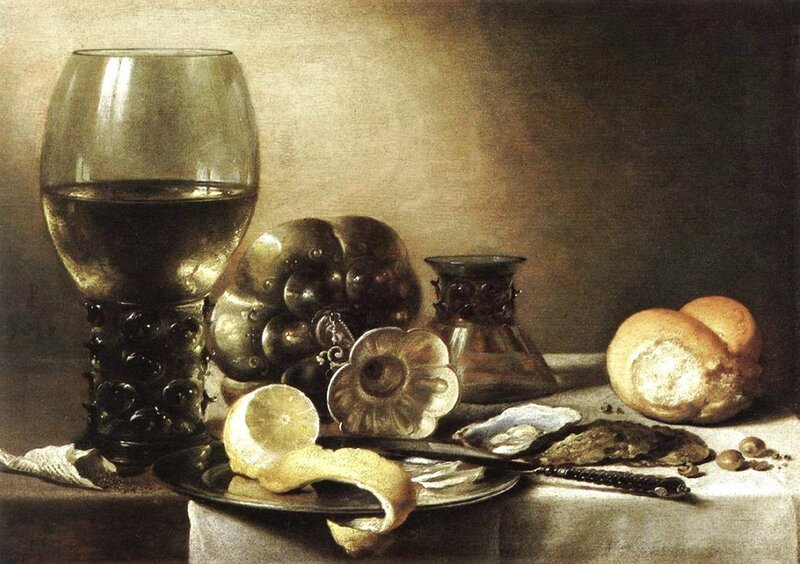 Taking aside all the allegedly embedded meaning in this genre of painting, when someone looks at Onbijt or breakfast pieces from Pieter Claesz or Heda; the accuracy of the representation of real the objects is shocking . The paintings look like modern photographs, demonstrating the level of skill achieved by these painters. Since today photo cameras can do the accuracy of the representation, I foolishly assumed that achieving the same image with a camera should be fairly easy. It turned out that not so, this weekend I spent a solid 6 hours to get produce two of Pieter Claesz paintings. Why, you may be wondering. Well, the articles I used don’t have the same proportions of his, therefore I had to try many, many times to get an arrangement that I could be happy with. E.g. it took me 54 exposures to get the first one. This is a great difference between painting and photography, as a painter you can choose to lit anything; the shadows don’t have to come from a specific light source. In photography, there is light or there isn’t. You can add it and then modify it, but you can’t fake it. Thanks Marvis, more will come soon.